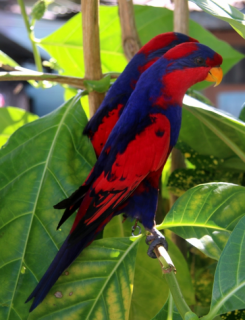 Red-and-blue Lories are sometimes seen flying from one island to another across expanses of ocean. E.h. histrio: Both adults mainly red in colour; wide purple/blue band on hindcrown; blue/lilac band from eye through ear coverts and sides of neck, meeting dark blue/purple of mantle and upper back; wide blue strip across chest; thighs black; undertail coverts washed blue; red/purple tail. Eye red. E.h. talautensis: Both adults as in histrio but with less black on wing coverts. E.h. challengeri: Both adults less blue strip on breast mixed with red; blue band from eye not extending to mantle; smaller in size. E.h. histrio: Blue wash on feathers of head and breast; blue on crown reaches nape and to below eyes; less obvious breast strip; thighs dull lilac. Eye brown. E.h. talautensis: As in adults. Screeches and whistles in flight, quiet while feeding. 3 x 1 x 2m (9.8 x 3.3 x 6.5 ft) enclosure with roosting box. Nectar made from baby cereal (lactose-free), honey and malt extract or molasses, mixed with water (bottled) with the addition of wheat germ, made fresh once or twice daily, or a proprietary type (store bought) for small species; as well fresh fruit such as: apple, orange, cactus fruits and bananas and a few vegetables (corn, green leaves, hardcooked egg, carrot). Hanging nectar bottles or cups around aviary, providing unsprayed browse with edible flowers, various chew and plastic toys (non-toxic); provide bowls of water for bathing. 9" x 9" x 27" (22.9cm x 22.9cm x 88.5cm) vertical box. Less than 4000, nominate possibly extinct. Habitat loss and wild bird trade. E.h. histrio: Sangihe Islands, Indonesia. E.h. talautensis: Talaud Islands, Indonesia. E.h. challengeri: Nanusa Islands, Indonesia. Forest and cultivated areas; up to 1250m (4100 ft). Pollen, nectar, fruit and insects and flowering coconut palms. Most commonly seen flying in groups. Up to 8 birds seen. Large numbers gather together to roost. Very vocal at these gatherings.